PAINTER’s Clean from Permatex contains no potentially toxic solvents or harsh paint thinners which can damage the skin, and is a safe alternative for getting hands clean. Especially formulated for the automotive smash repair and refurbishment market, Painter’s Clean contains only Dibasic Ester (DBE) which safely and effectively removes oil and urethane based paints, latex, lacquer, urethane adhesives, resins, body fillers, primers, silicones, clear coats, printer’s ink, oil, grease, varnishes, stains and grime. 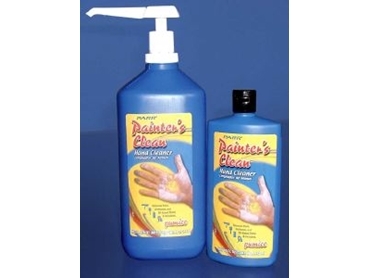 Painter’s Clean conditions the skin as it cleans with a formula that contains fine pumice. It is also fortified with aloe, lanolin and jojoba oil to nourish and protect the skin. Readily biodegradable, Painter’s Clean is also non-toxic and non-flammable.